Various reputable professionals will talk about the importance of Physical -, Occupational -, Speech -, and Oral Motor Therapy in the development of children with a disability or delay. 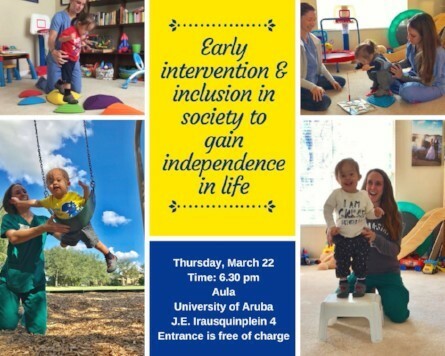 How early intervention and inclusion in society impact these children’s life and helps them gain their independence in life. Dr. Megan Moore graduated from the University of Central Florida with a Bachelor’s Degree in Health Service Administration in 2007 and a Doctorate of Physical Therapy in 2012. She completed her internship at both Arnold Palmer Hospital and Arnold Palmer Outpatient Clinic to prepare herself for a career in pediatric physical therapy. Dr. Moore worked in the acute care and inpatient rehab setting, providing therapy to both the pediatric and adult population. Here, she had the opportunity to work with a wide variety of patients with neurological, orthopedic, and cardiovascular diagnoses. She knew her passion was providing therapy to children and has spent the past 3 years of her career working closely with children in the natural environment for TLC Pediatric Therapies. She has experience with a variety of diagnosis including Down syndrome, Cerebral Palsy, Autism Spectrum Disorder, developmental delay, chromosomal abnormalities, seizure activity, torticollis, and many more. Dr. Moore has additional training in Neuro-developmental techniques and kinesiology taping. Providing optimal motor development and improved function through collaborations with families and other health care providers is her number one priority to allow greater independence to the child. Patti Hoger is a pediatric speech-language pathologist. She graduated with a Bachelor of Arts in Communication Sciences and Disorders from the University of Central Florida in 2011 and a Master of Arts in Communication Sciences and Disorders also from the University of Central Florida in 2014. She has a Certificate of Clinical Competence from the American Speech Language Hearing Association. Patti Hoger has worked in both the school and clinic pediatric settings. She has experience working with children diagnosed with varying medical diagnoses, as well as phonological disorders, fluency disorders, hearing loss, and Expressive/Receptive language disorders. In graduate school, she participated in a grant focalizing in Listening and Spoken Language for children with hearing loss and administered Auditory Verbal therapy. Whitney B. Pimentel, MA, CCC-SLP received her undergraduate degree from University of Central Arkansas and her Masters of Arts in Speech-Language Pathology from Louisiana Tech University. She has been providing speech, language, and feeding services to children birth-18 years old for over 15 year. Whitney Pimentel is the owner of Discovery Therapy and brings a variety of skills to her practice with a heavy educational background in feeding, motor speech disorders, and oral placement therapies. She is PROMPT trained and travels all over the country developing specialized Oral Placement, Speech, and Feeding program plans for families with children of special needs. Whitney enjoys working with all disciplines to develop goals, techniques, and staying informed of new procedures. Soren Richardson graduated from Hanze University of Applied Sciences in the Netherlands with a Bachelor’s degree in Human Resources. Soren also studied Sociology at the University of Groningen. She lives in Orlando, Florida with her husband and son. After the birth of her son, who has Down syndrome, she became an advocate and public speaker for Down syndrome and the Special Needs community, at first in Orlando and now branching out internationally as the co-founder and executive director of Amazing Reality Inc, a non-profit organization. Learn more about the NGO at www.amazingreality.org She is passionate about healthy living and improving the lives of people with special needs and finding ways to show their potential in life. She is also enthusiastic about holistic healthy remedies and is a wellness consultant for dōTERRA essential oil. Pa mas informacion por busca [U] University of Aruba den e alfabet menu riba homepage of por tuma contacto cu University of Aruba.